The History of KWK - The Soul of the City! 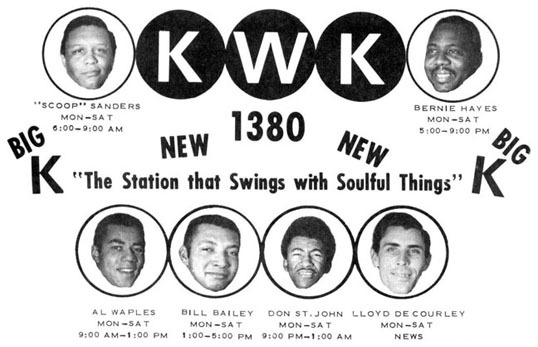 St. Louis radio station KWK lost its license to broadcast on AM 1380 in 1966 due to complaints leading the FCC to conclude the station had unfairly rigged a promotional contest. The station was then bought by a consortium of St. Louis and Detroit based owners. The local owners were Glennon and John Vatterott of St. Ann, Mo. and Col. Clifton Gates of St. Louis. The other owners were Dr. Haley Bell, Robert Bass and Dr. Wendell Cox, who owned WCHB Radio in their home town of Detroit. All owners, except the Vatterotts, were African Americans. Bernie Hayes, a Chicago native who arrived in St. Louis after a popular stay at KSOL in San Francisco, signed the station on the air in August, 1969. He was the Music Director and Operations Manager. The only other employee at that time was Al 'Scoop Sanders' Gay, the station's Promram Director, who had previously been the production manager and newscaster for Richard Miller's station KXLW. Two weeks after the sign-on, Bill Bailey, Don St. John and Al Waples joined the staff. Later Gary 'Records' Brown was given his first job in radio at the station. Other memorable jocks on KWK included Tom Joyner, Jake Jordan, Randy Calendar, Rick Williams, Donn Johnson, Bobby Knight, Silky Slim Stittum, Jim Gates, Decater Agnew and Bill Moore. The station's original slogan was the Soul of the City. This was followed by Kwik Soul 1380 and The Soul Brotherhood. With 5000 watts of power, 24 hours a day, the station was affiliated with the Mutual Broadcasting Network and could be heard as far way as Memphis, Tennessee and Detroit, Michigan and parts of Texas. Under the leadership of Sanders and Hayes (who were both college educated) the station became number one in its format upon its first ratings book (Pulse-Arbitron). The competing stations KATZ and KXLW reacted by increasing their money give away contests and attempting to become more visible in the community, but by then KWK had captured a significant amount of the African American audience and most of the white R&B fans. In addition to playing great great music, KWK cared about the community and promoted successful events such as fund raisers for charities and food drives for the poor and collected Christmas toys for children. KWK became the premier show promoters in the area. Many major R&B recording artists visited the station when in town, including James Brown, Stevie Wonder, Cheech and Chong (when they were musicians), Billy Eckstein and The Temptations. In 1972, KWK's owners hired a management team from the Mid South to run the station. In May, they demoted Hayes from MD and Operations Manager to Advertising Salesman. This and a few other racial discriminating personnel changes provoked Hayes and seven other disc jockeys to walk off the job. This stand-off kept KWK off the air for a week until the Detroit owners flew down, released the newly hired management team and reinstated Hayes and others in their previous roles as the station returned. Later that year Hayes left KWK to replace Scoop Sanders, who had left KWK earlier in the year, as an announcer and weatherman for the ABC-TV affiliate KTVI Channel 2. A member of the inaugural class of the St. Louis Radio Hall of Fame, Bernie Hayes started his career in 1950 as an Armed Forces radio announcer while serving his country in the Air Force. This was followed by an early career in radio spent in Chicago, Newark, Alexandria LA, New York City and San Francisco, before landing in St. Louis at KATZ in April, 1965. In addition to KWK, Hayes has held executive positions at St. Louis radio stations KATZ, KKSS, KIRL, WESL, KXLW and KADI. He hosted the 'Soul Brotherhood' and 'Black Circle Hours' television dance programs on KDNL TV-30 and 'Dialing for Dollars' on KTVI TV-2. Hayes later became the News Director at KWMU, the St. Louis NPR station broadcast from the University of Missouri-St. Louis. During his time in radio Hayes also recorded songs for labels that included Stax subsidiary Volt Records and he produced a number of recording acts including Fontella Bass. While broadcasting The Soul of the City, KWK was located in a flood plain at 500 Terminal Row off Hall Street. Because of this location, many people believe the great flood of 1973 knocked KWK off the air for 5 years. Even though the office flooded frequently, neither the studios nor the equipment ever got wet. The culprit was the station's transmitter. It was old and parts were hard to acquire. In the first two years, KWK was off the air frequently for about two days at a time. That problem was finally corrected, but the St. Louis owners and the Detroit owners were fighting for control. Eventually the St. Louis group gained control and Detroit pulled its money out. That divestment blurred the focus needed to sustain a viable station. KWK's operations soon ceased and the station went dark in 1973 until Doubleday brought it back in November 1978. Dr. Don Sainte-Johnn (aka Don St. John) remembers: KWK brought me in from Los Angeles, fresh out of college. I worked at DJ, later promoted to Production Manager, Chief Announcer (whatever the hell that was), Program Director and eventually Operations Manager. I also served as Acting Chief Engineer. (I was the only pinm of the block with a First Phone thanks to Radio Engineering Institute in Glendale, CA). The powers at Gateway broadcasting opted to trial-promote me from within the ranks. They did this by creating the title of Chief Announcer (easing me into the j-o-b), which served the purpose for both The Company and Yours Truly. Bernie was always Music Director during my stint at KWK, which was more powerful and offered more visibility than the mundane chores of reporting to Detroit--headquarters for Gateway Broadcasting (scheduling, imaging, contesting, free community appearances, PR, in general 'riding-herd' etc.). Special Thanks to Bernie Hayes, Dr. Don Sainte-Johnn, Kerry M. and Tom for help with this page. See a 7" of the Bernie Hayes song 'Cool Strut' on Volt Records.